National Association for Catering and Events, Triangle Chapter – “Best of Nace” Award for Best Printed Collateral for a wedding in the Triangle in 2012 – A Swanky Affair won for our collection of two-color letterpress invitations and many details for Diane and Rob’s vintage Durham and jazz inspired wedding. International Live Events Association, Raleigh-Durham Chapter, 2014 “Trinity Award” for Best Corporate Event, Budget Under $75,000 – Triangle Catering Hospitality Group won for the Belt Line Station Grand Opening with a vintage circus theme. We created poster sized invitations and a hundred signs and other decor items for the design of this gala event. The event was also featured in Southern Bride & Groom. SHOP LOCAL! We are a member of Sustain-a-Bull in Durham, North Carolina, and The Bliss Collection in Northern Virginia. 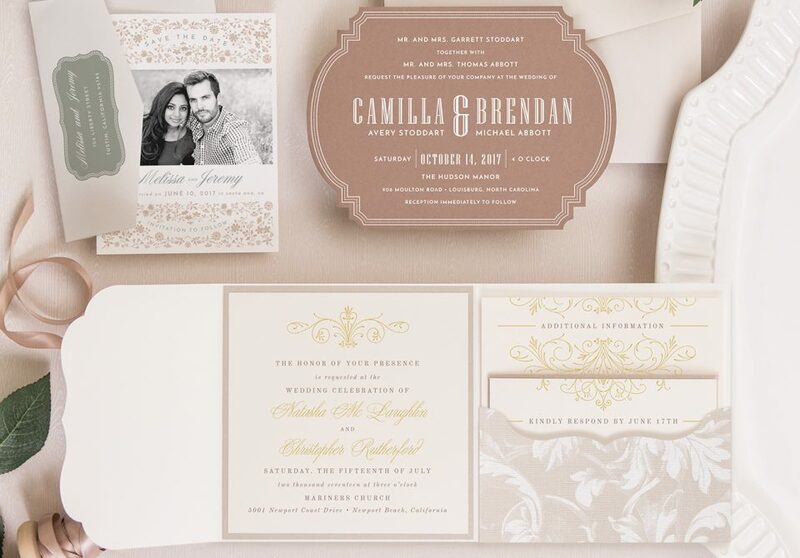 We have been creating our own customized invitation designs with Envelopments fine stationery supplies since 2006. We also retail the Envelopments design collection of creative invitations. If you would like to order a design, we can place the order for you, provide you with swatches, and create coordinated programs, place cards, and other event details to match. Our website is under construction, but please look around. We have posted hundreds of past projects in our extensive portfolio, and you can also browse our design collections as a starting point for your project. For even more ideas about our capabilities, please visit our Facebook and Pinterest galleries, and while you’re there, you should follow us to see new ideas as they are posted. You can also see real weddings and other corporate events that we helped to create on our blog. We are currently booking weddings and corporate projects through fall 2017, and our schedule fills up quickly. Make your appointment today!